28-Mar-2009 -- This is the 60th of a series of 83 confluence visits during our voyage from Nigeria to Europe and back to Nigeria around the entire African continent. It all started on 28 January 2008 at 11N 5E. Story continues from 5S 36E. We spent the night at Kondoa. We were leaving very early and continued our trip to Dodoma. Around midday we were in the wine cultivation area of Tanzania which is about 30 km north of Dodoma and about 25 km from the Confluence. 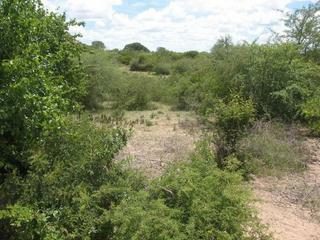 We tried several roads to get closer to the Confluence but did not succeed and continued quite frustrated to Dodoma. We continued our trip from Dodoma to Morogoro on a good tarred road. This road after 30 km bypasses the Confluence by 16 km. Before the village of Buigiri we found a suitable road that lead us more or less in straight line as close as 6 km to the Confluence. At a village the road took a different direction and we only managed to get as close as 4.25 km to the Confluence. We tried in vain to find a path in the desired direction but no such luck this time again. The thorn bush is very thick in this area and it would have been impossible for us to get to this Confluence before the night fell.